Cue the wedding bells (or the Moroccan equivalent) because 90 Day Fiance star Nicole Nafziger is getting married! To Azan! In Morocco! Or, at least, that’s her plan. As we reported in a our 90 Day Fiance franchise 2018 cast spoilers post yesterday, Nicole recently shared several social media posts in which she was seen at Bearer of the Bling Bridal shop with her mom, apparently shopping for a wedding dress. We weren’t sure what to make of it — was she planning on marrying Azan? Or perhaps she has found true love with someone new here in the US and is rushing to the altar? One source reporting Nicole’s wedding plans is 90 Day Fiance Youtuber Keith Brooks, who is in contact with numerous sources close to Azan and Nicole. In a video posted moments ago, Keith announces that Nicole is indeed heading back to Morocco with plans of marrying Azan. He says that she will most likely be leaving in the next couple weeks. His sources in Morocco say that TLC cameras are not going to be documenting Nicole’s trip this time, but he says that could change. We spoke with a source who says TLC (and Sharp Productions) IS filming Nicole and cameras WILL be there when (or if) she and Azan walk down the aisle — or whatever it is they do in a Moroccan wedding ceremony. Clearly, Nicole’s wedding plans will have millions of viewers shaking their collective damn heads, but I simply cannot believe it would even be an option for her unless TLC was filming (and financing) it. Neither Keith nor our source could confirm or deny whether or not Nicole’s daughter May will be going on the trip this time. The “minimum income requirements” clause is what makes it almost a certainty that TLC will be filming. 90 Day Fiance (and Before the 90 Days) cast members don’t make much money in their first season, but once they are asked back, then the compensation increases dramatically. Keith is told Nicole is making somewhere in the range of $3,000-$5,000 an episode. I would imagine that Azan is making similar, whether that is directly or through Nicole via an increased per episode rate. (There’s NO WAY Azan would continue to do this show without bringing in some rather substantial $$$ (or د.إد.إد.إ). I have heard reports that Azan’s K-1 visa denial was due in part to some sort of security issue, and Keith mentions something in his video about Azan flying to a country flagged as a security risk by the US and then needing Nicole’s help to get a one-way ticket back home. (???) If that’s the case, then I would assume he would have the same issue when applying for a CR-1 visa? Speaking of the CR-1 visa, there are a number of couples from Before the 90 Days currently in foreign countries (Sean and Abby, Paul and Karine, Larry and Jenny) — could it be that we will see one or more of them get married in hopes of bettering their chances at a visa? The potential ratings boost from a “secret foreign wedding” has got to be pretty enticing to TLC. Hmmm… The more I think about it, the more this sounds like a guaranteed thing we can expect. Back to Nicole and Azan. Keith says he will be posting a video soon in which he will be talking to one of Azan’s six online girlfriends, and what she has to say is reportedly “not going to be nice,” including everything Azan said about Nicole behind her back. I stand behind my previous prediction that what we will see this season is all of the drama of Nicole and Azan planning a Moroccan wedding right up until just before the wedding (days, maybe hours before) at which point Azan will get cold feet. I can already see the TLC producers reaching out to these same six “online girlfriends” of Azan in hopes of being able to drop that bomb on Nicole just prior to the wedding. There will be lots of pushing and shoving and chasing before Azan finally decides to walk away for good — after cashing his paycheck of course. I guess I’m OK with that story line as long as May doesn’t get all caught up in it. So are you excited to see Nicole hop aboard her wreck-loving locomotive for yet another trip to Morocco? 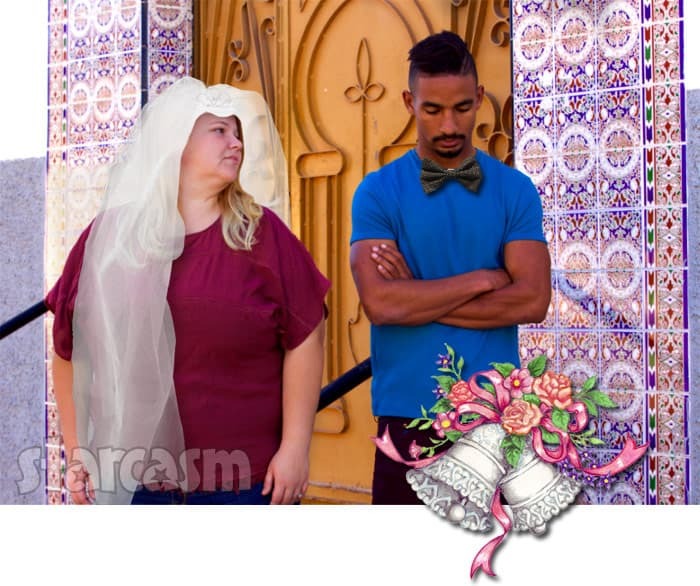 And what do you think the odds of Nicole and Azan actually getting married are?